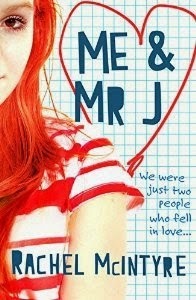 I really enjoyed Me and Mr J by Rachel McIntyre. I find myself weirdly attracted to story lines that feature student/teacher relationships. I'm not even sure what that says about me, but I'm just going to go with it and say I really like the complications and emotions that go along with this type of forbidden relationship. And I think the bullying aspects of the book were well done too and I liked that this book two main story lines really tie in well with each other. Me and Mr J is a story told in a diary format from 15 year old Lara. Things are not so great in Lara's life at the beginning of the story as her best friend has moved away, her dad has lost his job and the fact that Lara is being bullied at school because of her lower income and her mom's job as a maid. I really liked Lara right from the start. I think she has a great voice and I loved how while she didn't always stick up for herself she at least never felt embarrassed about her family's circumstances or about her mother taking on cleaning jobs. I like that instead of complaining about her lot in life, she does her best to take on jobs herself in order to maintain her hobbies while things are tough at home. She's got a good relationship with her Nan and I quite liked that. I think Lara's family circumstances were quite hard to read as were a lot of Lara's thoughts on her bullying, and, of course, the actually accounts of bullying which start with name-calling and humiliation in front of others and escalates over time to physical and sexual assault. There's quite a lot of victim-blaming from Lara throughout the first 2/3 of the book which was really uncomfortable to read and one of my main issues with this book is that Lara isn't specifically told or comes to any strong conclusion herself about her lack of blame in 'bringing it on herself.' I did want that to be a little bit clearer. And this escalation in bullying, I think, is what brings Lara into feeling how does about her teacher. With everything in Lara's life very difficult, with her bullies tormenting her at every turn, her family falling apart and the added stress of bearing the brunt of her parent's frustrations, Lara blossoms under any praise or nice word from her new, young, fit teacher. I thought it was interesting how the author illustrates Mr J and the circumstances in which he comes to this place in which he is potentially involved with a student on a romantic level. I loved Lara to . it was such a amazing book but so ship Bara (Ben and Lara) so hard and aslo fealt really sorry for lara.